"Ontogeny recapitulates phylogeny" is a pithy phrase coined by Ernst Haeckel, a 19th-century German biologist, philosopher, and naturalist artist to mean that the development of an organism (ontogeny) expresses all the intermediate forms of its ancestors throughout evolution (phylogeny). I have long thought Haeckel’s word byte offers insight into the evolutionary kinship, both mechanically and spiritually, of chainsaws and snowmobiles. The morphology of chainsaws goes back to the early 19th century with hand-cranked surgical bone saws and came to fruition early in the 20th with a patent for a recognizable gasoline-driven chainsaw designed to fell giant redwoods. Both early chainsaws and snowmobiles were powered by a two-stroke gasoline engine that drove an endless loop of toothed saw chain or snowmobile track via a belt driven centrifugal clutch. Compare the two machines on an autopsy table and the kinship of the two is obvious. Both are useful tools. Both can be nefarious in the wrong hands. In either case ancestrally they are close cousins. And one has come to shape the winter experience for many in Yellowstone. Years ago, after a thoughtful perusal of the belt-driven pulley system under the hood of my snowmobile in Yellowstone, my English father-in-law, an engineer of the old school, turned and, somewhat dismissively, declared the snowmobile to be a piece of farm machinery. Morphologically he had a point. I have a complicated bi-polar relationship with snowmobiles; they deliver me into the other world by necessity and yet they are antithetic to that very serenity. To sporting devotees/aficionados, snowmobiles are “sleds”; to those less enthusiastic they are “beals”. To me the word “sled” evokes the image of my childhood Flexible Flyer No. 251 Junior (Sled), so if I have to choose between the two monikers I suppose I am of the “beal” inclined crowd. 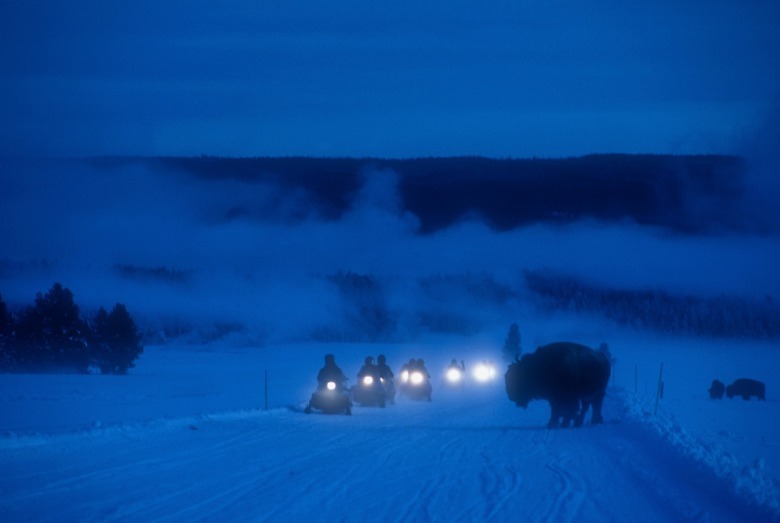 In the first several decades of my experience in Yellowstone, snowmobiles were primitive machines—unreliable, dogged with fuel line freeze ups and a mélange of mechanical failures. If you depended on one with your life and were unprepared to deal with the consequences of a break down in the middle of nowhere on a 40-below night, their failure could kill you. 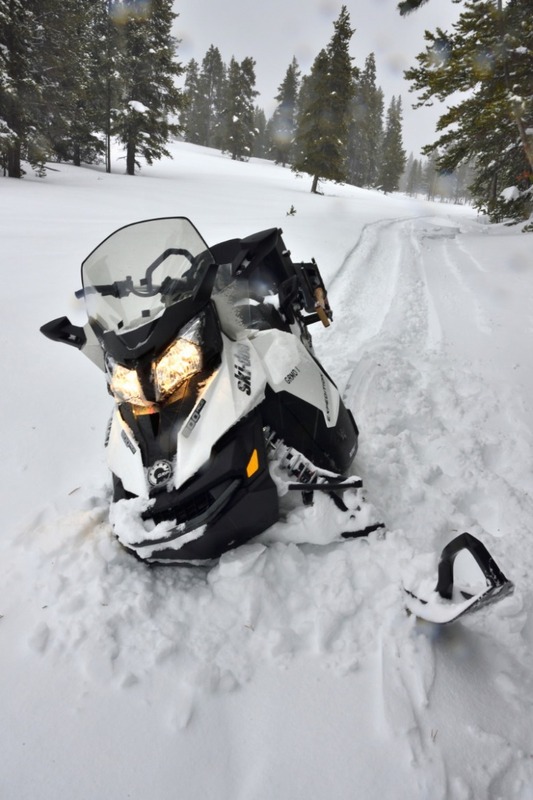 "In the first several decades of my experience in Yellowstone, snowmobiles were primitive machines—unreliable, dogged with fuel line freeze ups and a mélange of mechanical failures. If you depended on one with your life and it broke down in the middle of nowhere, their failure could kill you." It was years before I had a machine with heated hand grips—a strikingly profound innovation. “Bealer’s Thumb”, the threat of a frost-bitten throttle thumb, was for years a pain accompaniment of the snowmobile adventure. Those early jobs had no luggage rack and their low sporty windshields were ineffectual in the face of speed generated wind-chill. They were filthy things, enveloping the rider at start-up in a dense cloud of stinking blue smoke laden with a potpourri of carcinogens. To anyone within earshot they were noisy and at a distance their sound could be mistaken for that of a working chain saw. Pete Townshend got Tinnitus from playing air guitar in front of giant woofers; deafness, or serial ringing in the ears, could come from the roaring back of a beal engine. 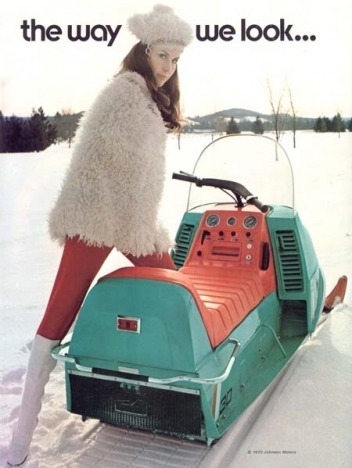 In the early years of snowmobile development, when machines were notoriously unreliable, manufacturers unveiled all kinds of advertising to make their products look fashionable, as with this ad by Johnson. It's one that Steven Fuller kept, reminding him how far technology has come. In 45 winters here I have spent a great deal of time astride a snowmobile. I have never thought of a them as anything but a useful tool, both in facilitating my work and as a convenient motorized means of infrequent trips to and fro the distant outer urban fringes of the park. This acknowledgement is not an assertion of my moral superiority to other’s use of snowmobiles. If the National Park Service had mandated dog sleds or hot air balloons as the designated mode of winter travel in Yellowstone I would be mushing or drifting overhead. I sometimes remark, when asked about my relationship with snowmobiles, that the first 100,000 miles on them was fun…not literally true, since they were often a source of frustration, inconvenience, and stranding…but still, there is the pleasure of mastering them, as there is in riding horses in wild country, or backcountry skiing finding your way through challenging topography, or driving a 4X4 for weeks in a roadless region of Africa. In conversations regarding my use of snowmobiles I have claimed, a bit of tongue in cheek, to be the “Baryshnikov of Bealers,” an assertion based on my decades long practice of extreme “Body English”, that “danser avec la machine”, required to maneuver the snowmobile towing a ten-foot long ladder and snow tools amongst my 100-plus buildings, despite the obstacles and pitfalls, to a place at each where I could successfully mount the building and winterkeep it’s roof. As with infantrymen under fire, a winterkeeper’s best friend is his shovel. Never leave home without it. With the right shovel and a thoughtful evaluation of the situation you can get a beal out of a hell of a hole. There have been a few situations that on first assessment seemed hopeless. A prolonged predicament inevitable. When engineering a self-extraction of a floundered snowmobile I remind myself: don’t take short cuts, do the prep right, do it patiently, do it once, and you will climb the beast out of that hole. Or you could end up like a Yellowstone version of Robert Falcon Scott. There follows a brief history of my romance with beals which has characteristics common in my life with horses and women. My first beal at Canyon, our first winter of 1973-‘74, was a Johnson (see the advert blurb poster). It was worn out when I was given it by the old Yellowstone Park Company, my first employer here. The previous Canyon winterkeeper, who only did one winter at Canyon, put many miles on the machine commuting 38 miles to park headquarters to where he lived and back to Canyon any weekend the weather permitted. For him the winterkeeper job was a hardship posting. It was work he undertook out of financial necessity. There was no sense of adventure let alone of romance in the posting. It was a job for losers or the desperate, not like now, when it is a dream job for the romantics among us. In the course of the nearly 90 years’ history of winterkeepers posted at Canyon before me deep winter isolation was routine. The winterkeepers were self powered. Want your mail? Ski twenty miles over Dunraven Pass to Tower junction once a month and stay the night with the ranger there, then ski back home to Canyon the next day, weather permitting. 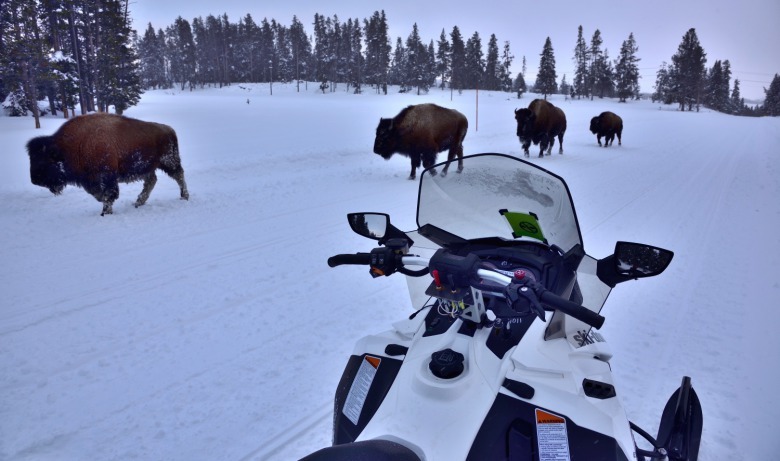 We arrived at Canyon when snowmobiles, despite their limitations, were starting to change the challenges of over-wintering in the interior of Yellowstone. 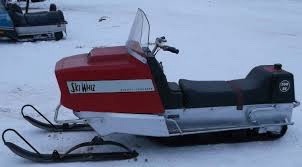 In the 1960s and 70s there were about a hundred makers of “snowmobiles.” Like my first beal. most were primitive, technically naïve, and in the case of my first one, worn out. Our first winter my wife mounted that beal to take out the garbage. Half-way down the hill the throttle stuck, she fell off, and the beal gracefully arched down-slope motoring straight for the Grand Canyon of the Yellowstone, a few hundred yards below. 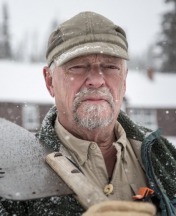 "Our first winter my wife mounted that beal to take out the garbage. Half-way down the hill the throttle stuck, she fell off, and the beal gracefully arched down-slope motoring straight for the Grand Canyon of the Yellowstone, a few hundred yards below." Later that winter, I was driving the same machine to work, when its’ rust spotted chromed bicycle handle bars broke at the welded T-joint and I was left holding the handle bars with no connection to the machine as I went blazing down the road. At the end of a work day, the Johnson wouldn’t start, so I abandoned it and skied the mile back home. Later that spring a grizzly bear pleasured itself by tearing foam chunks out of the vinyl-covered seat. This was the first of three more grizz snowmobile seat vandalisms in spring. After the death of the Johnson, each winter there followed a string of “one season stands” with company provided cheap dysfunctional snowmobiles: a Massey-Fergeson—they should have stayed with tractors; a John Deere, ditto; a Kawasaki: underbuilt, with no cargo rack options what-so-ever and it reliably ran out of gas when the gauge claimed the tank was ¼ full and many more of the dirty dozens of machines I had difficult relationships with. Over the years, in fits and starts, snowmobile technology improved until today the company provides me with the finest utility snowmobile ever made. And, of course, as my snowmobile prospects improved, so too did the prospects for visitors wanting to make runs into the park, mostly from West Yellowstone to Old Faithful. Thus began, an opportunity, an industry, a popular activity, a problem, a conflict, a controversy and a reconciliation. For decades, routinely, I expected, was always prepared and rarely disappointed, to deal with break downs. I integrated an always on-board bivy kit so as to be able to survive, in relative comfort, were I stranded overnight. In the course of those years I walked the roads between Canyon and park headquarters at night on several occasions. This was true especially when I was ferrying my family back and forth to school 34 miles north for the week. One of our first winters at Canyon we were asked to host a National Geographic photographer and his wife while he photographed Yellowstone for a book project. We had a delightful week together, both in the field and around the dinner table. Come time for them to leave, the tail end of the winter season, they were headed for West Yellowstone where he was to photograph the end of the Winter Snowmobile Jamboree. That year I did not have a snowmobile. The clutch on the pathetic machine the company had given me seized-up early in the season. 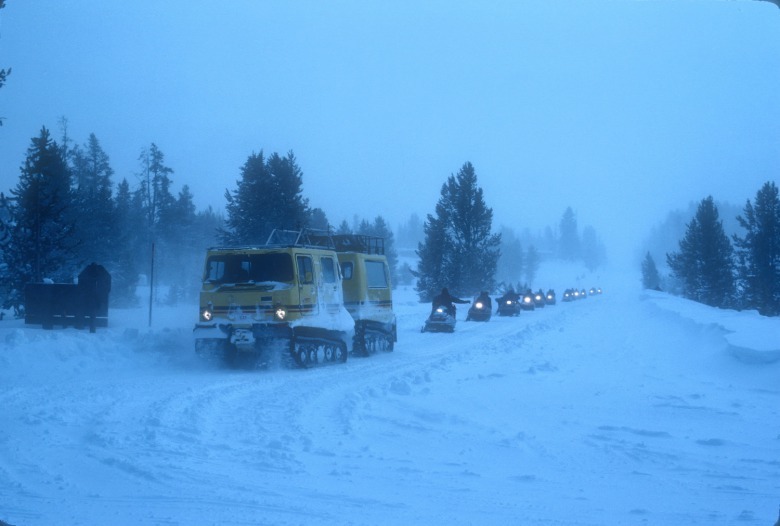 Unable to fix it myself I took the one-lunger engine with attached clutch in my arms on my skis down to the road and put it on a snow coach headed for the maintenance service center 40 miles to the north at park headquarters in Mammoth. I never saw it again. So throughout that winter I skied the mile to work where I moved from building to building with a ten-foot ladder, a shovel, and my six-foot snow saw on my shoulders in order to cut the snow cornices off the many buildings for which I was responsible. But, late that winter, I was keen to see the National Geographic photographer at work, so I rode as a passenger on his beal 40 miles out to West Yellowstone. The day they left West to return to Geographic headquarters in Washington, D.C. I bought a box of grocery treats for the family back at Canyon. We had had no re-supply in the whole course of the winter, so I took advantage. I caught the last snowcoach leaving West bound for Mammoth with the expectation that the driver would drop me at Canyon on his way north. “You gotta be kidding?” I suggested. In those days I had no clout and he had a higher priority. I suspected: a hot date with his bartender down in Gardiner. Back then, I never left home without my skis (seven-foot-long wooden Laplanders, and my kit, which always included a skein of mil spec parachute cord). So as the snow coach accelerated out of sight headed north and the sun faded into twilight I broke up a wooden road side snow pole and with the parachute cordage fashioned a crude sled out of my skis, then made a harness out of the cord. As the night-time cold deepened and the light faded I squatted in the snow and ate a little bit out of the box of groceries. Then I hooked-up and trudged east, over the top of Blanding Pass, accounting the 14 miles to my front door step by step. About midnight a crescent moon was setting, the sky was animated by scudding Halloween-looking clouds. When I arrived at my front door about 2:30 am I was startled to see six sets of skis and poles set vertically outside in the snow. Inside my wife was waiting in the kitchen for me. There were six sleeping bags in front of the living room heater. 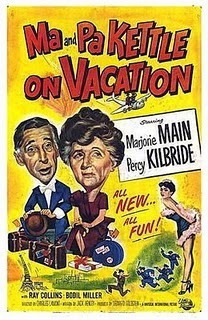 Angela, my wife, told me the ski party had showed up that evening after being lost in the Hayden Valley for three days. They had been living on GORP (“the horror!”) and they said that earlier that night they had encountered a grizzly bear and one of their party in panic had fallen into Alum Creek. They had arrived at our door in poor condition. While listening to the story I devoured a litre of strong milky sugared tea and a pile of buttered marmite toast before slipping into the luxury of our bed. Had I had a beal this adventure would likely have been forgotten. Another time, five miles from home, the sun was setting and the temperature was plummeting when the dread big red warning light on the snowmobile dashboard lit up, “Engine is overheating, stop now!” A coolant leak. First I tried melting a bushel of dry powder snow on the heat of the engine. Results: a thimble of liquid water. Options? I didn’t want to walk home with my box of groceries (again). Beers! I had a six pack! So, after reviewing the options, reluctantly I poured the beers into the radiator. I re-started the engine, the red light stayed off, so I motored home. In retrospect I thought I should have taken my time, drunk the beers, then added them to the radiator recycled. In the course of the couple of decades of my early winters at Canyon the numbers of visitors, the majority on dirty noisy two-stroke snowmobiles, either rented or privately owned, ramped up. Just as I was entranced by the glories of winter in Yellowstone others near and far heard about this “winter wonderland”, what was becoming known as a “quintessential American outdoor experience,” and they came in rapidly increasing numbers. By the 90’s the sight and scent of blue haze at the West Entrance gate house in the morning and at Old Faithful at mid-day was routine when a thousand, or on three-day week-ends, 1400 snowmobiles passed through the west gate to lunch at Old Faithful. The Park Service authorities were increasingly concerned, then alarmed, about the conditions and the diminished quality of the experience that was becoming routine here in winter. Rangers manning the entrance station at West Yellowstone on some days had to wear gas masks so as not to succumb to the fumes. Some among the snowmobile sub-culture deliberately flaunted park regulations, leaving a double snowmobile track on either side of a sign warning that “Off road travel was prohibited and punishable” by a substantial fine, or by peeing on other regulatory notices. Outlaw snowmobilers increasingly made illegal gang incursions deep into the backcountry of the park. In the face of the dogged political and legal resistance by special interests, particularly by the gateway communities and their larger allies who had no greater vision than preserving the “money cow” rather than the unique qualities of the park, the Park Service, much to their credit, evolved a management plan formulated so as to reclaim for conventional visitors the aesthetic values of a winter trip into the park undiminished by noise, pollution, and congestion. For now, the plan is largely successful. The plan, however, came at a cost to some, especially those with a dream of winter wonderland and a tight budgets. Currently (2018) four nights at Old Faithful Snowlodge double occupancy including meals and transportation to and from the west entrance, but not including taxes or utility fee, cost $2,239 per person. Higher end, for example, National Geographic Expeditions five days (Bozeman into the park and back out) $5,195 per person double occupancy, airfare to Bozeman not included. The package 2019 will add $900 to the cost. You can go to Africa on that. A basic snowcoach day trip from West Yellowstone to Old Faithful costs $135 per person. Guided day-trip snowmobile tours from West to Old Faithful cost $265 for a snowmobile with double riders. Only guided snowmobile tours were permitted and they have to be made on BAT (Best Available Technology)—clean, quiet snowmobiles. The clientele at Old Faithful Snow Lodge has changed since the regulations were first starting to be instituted. Now those at dinner in the Snow Lodge any evening are a mono-culture, nearly all appear to be Baby Boomer couples (except for the guides, who look like me). Most have come in on a week-long high-end package tour. Local or regional people with families are very rare. 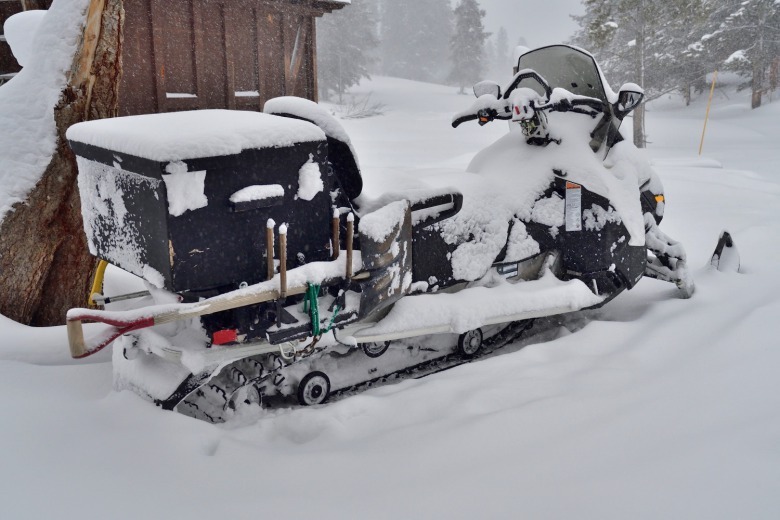 Independent snowmobiles are excluded, except for those that may have won a spot in the complex lottery system for independent winter snowmobile access instituted this year. With the new regulations a winter visit to Yellowstone is much quieter, the air is much cleaner, there is less yellow snow, the visitor experience is much improved and I suspect the wildlife is a little less stressed. But, it is costly to visit Wonderland in winter. Ma and Pa Kettle and kids will find no affordable access, let alone food and shelter here in winter, to this American people’s park. This was not always the case. During its peak in the late 20th-century snowmobiling was a working class and often family endeavor. But demographics have changed. Now much of the snowmobile industry’s market is targeted on “highmarkers”—young men, relatively affluent, often from the regional boomtowns fed by fossil fuel production, who ride machines specifically designed for the acceleration required to climb as high as possible, ideally up a 30 to 45 percent grade, toward the summit of a mountain face outside the park. As the slope gets steeper the machine threatens to stall so the rider must execute a 180 degrees turn and descend before he bogs or rolls the machine. After a few beers with his bros another rider attempts to high mark beyond that of the first rider. These guys play in the avalanche kill zone, part of the thrill of the sport. This is the kind of Darwinian thing guys do, always have, and always will. 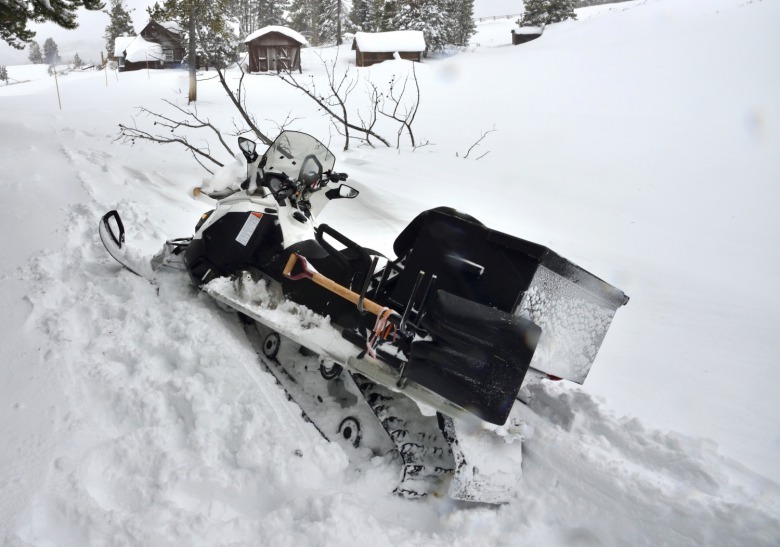 "Highmarking accounts for more than 63 percent of the avalanche fatalities involving snowmobilers in North America,” according to stats. Fortunately, for the sake of Yellowstone, off-trail bealing is banned in the park. So the conquest of the nivean frontier advances until the highest reaches of our mountains are conquered in the pursuit of amusement, trophy hunting, and self-aggrandizement. And So It Goes, another of the fast diminishing cache of sacred places world wide are being trashed and checked off the collective bucket list. I am thankful that highmarking is prohibited in the park. "Now much of the snowmobile industry’s market is targeted on “highmarkers”—young men, relatively affluent, often from the regional boomtowns fed by fossil fuel production, who ride machines specifically designed for the acceleration required to climb as high as possible, ideally up a 30 to 45 percent grade, toward the summit of a mountain face outside the park." The ideology of the current American political regime sees our commons as nothing more than a monetizable commodity to be gifted to corporate and private greed. Nothing is sacred, all is available for a price—people, communities, and the natural world. The opportunity for “highmarkers” to trophy the upper rim of the Yellowstone caldera overlooking the iconic Grand Canyon of the Yellowstone is not so far fetched. Our public lands, even our sacrosanct national parks and monuments, not to mention our less protected public lands, are being opened to all manner of unprecedented deprivations. The incredible has become the “new normal” in this post “American Century,” and the panoply of the incredible continues to skyrocket as we live through metastasizing desperate times that recapitulate those our ancestors lived through, but which we naively thought we would not repeat yet again. The despoilers, emboldened by our collective paralysis, like deer in the face of apocalypse, will likely have their way and our descendants will be left to live for the rest of the 21st century and long beyond mining the benefice of our luxuriously-endowed landfills. Maybe, one of my distant descendants will even uncover one of my snowmobiles in a junk yard landfill, fossilized in rust and polymer degradation and make an icon, an effigy, an idol of it…in memoriam to that long ago time when we strode the earth as human gods.